Daisy, founder of Digitool, went live on Facebook to give tips on how to create a social media strategy for your cleaning business. Daisy regularly hosts live webinars on Facebook giving you the opportunity to ask her questions and get them answered in real time. Make sure you don’t miss out on the next live chat – click here to be notified when the next live event will happen. Daisy attended BrightonSEO -the biggest social media conference in Europe- on April 27th and here are some really interesting tips she learnt and how you can apply them to your cleaning business. It is an easy guide to follow to ensure that you’ve got a social media strategy for your cleaning business. These strategies are easy to implement, easy to follow and they will save you time. That’s how you can be active on Facebook without being on it every night. As social media changes, you have to change your social media strategy. Being active on Facebook is super important. It can give you the opportunity to attract new customers to your business. One of the biggest influencers on potential customers’ buying decisions is sharing your past customer’s reviews. A study, undertaken by BrightLocal, shows that 93% of people read online reviews before choosing where to go. So, 93% of your customers are checking that you have online reviews and making their decision based on that. There is a “reviews” tab on Facebook, which gives your customers the opportunity to you 5-star glowing reviews about your company. Then, you can share these reviews on your Facebook page. For brownie points, and if your customer agrees, you can take a picture of your customer and put his review as an image featuring their quote. These pictures is tend to be more engaging given that there is a person related to it, inducing perceptions of trustworthiness from viewers. 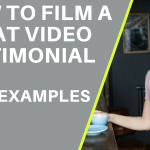 Visual representation is one of the key ways to promote your company (click here to watch How To Create A Perfect Video Testimonial). For example, using a picture of a woman with a dog has the potential to attract pet owners, who may be part of your target market. Be sure to add your branding and contact details clearly, making contacting you as easy as possible. For example, Smile Carpet Cleaning talked about “Colin”, a member of their staff, in some of their posts. From this, people began to know who Colin is, and they even began searching “Colin Smile Carpet Cleaning” to get to their website. Tagging people on your post can allow you to show your professionalism and to have more visibility. For example, write a post and tag your acquaintances such as electricians, painters, decorators, builders, with a positive message such as “Local businesses love Friday!”. Tagging people in posts helps you gain awareness from people who follow those that you’ve tagged, who may not have found you otherwise. In addition, it allows you To tag someone, it’s simple, you just need to do a “@” and just tipping whatever it is (example: “@smartcarpetcleaning”). It is really counterproductive and causing controversy for your company because you’re giving a bad vision of you and your company. Your business page is not the place to share this kind of information. You can share it on your personal page but not on your company page as it risks dividing people, and ultimately losing you custom. People who go on your page want to know more about cleaning and your company, they’re not expecting to see news articles or your views. A surprising amount of companies will post images which show a dirty bucket of water while they’re cleaning, thinking it’s showcasing how dirty somewhere was before they cleaned it. However, showing these pictures is not selling your business, rather it creates an association between your company and dirt! Think about different way to show how necessary a clean was, perhaps something more visually stimulating and entertaining. For example, you can use a video testimonial of a past customer, or a “before/after” picture (click here to watch our video on How To Take Before And After Photos For Your Cleaning Business). There is plenty of different software you can use to create quality looking graphics to accompany your posts, without needing a graphic designer. To create images as good as this one, we use free software like Canva.com. You can import the pictures you want and use templates, simply editing text or pictures as you like. Then, you can easily download it for use. After creating your graphics to accompany your posts, you’ll want to think about scheduling these posts using Hootsuite.com. You can add 3 social media platforms (Facebook, Twitter, Instagram, etc) and schedule 13 posts FOR FREE. If you want more, you have to pay for it (£16/month). Hootsuite.com saves you hours each month. You can compose a message, add links, mention people, add images, and schedule them to post automatically. For example, on Sunday, you can schedule your next 13 posts to go out over the next month in one go! It also works very well if you want to talk about an event that’s coming up (Christmas, spring cleaning, Easter…), and wish to schedule this in advance. If This Then That, functions off rules outlining that if one thing happens, another thing should happen as a result of this. It is essentially a rule platform. For example, if I put a post on Facebook, then post this on Instagram. If it is the first of the month,post this on Facebook. If someone follows me on Twitter, send a message thanking them. Some of these examples can really help you save time in the long-run. The best way to promote your company is to be the admin of a Facebook group. If you are an admin of a Facebook group, you can get details of your group (engagement rate, what it is shared, how people are posting, how often, what they are talking about). Following policy changes, Facebook is going to start to focus more on Facebook groups than Facebook pages. It is really important because there are lots of local groups (groups related to your the city, for example). Facebook is beginning to prioritise these. How you can use Facebook groups to your advantage for your cleaning business? That means don’t copy and paste the same message repeatedly- it will immediately be flagged as spam, and irritates group members! The best way to promote your services is to start a conversation. You can talk about local events you’re going to or help someone who needs help (click here to watch our video on How to Get Business From Local Facebook Group). Facebook Pixels are a codes that you put on your websites. Then, it tags anyone who visits your website and it allows you to advertise these people when they go on Facebook. You can create adverts that don’t cost a lot of money, and you can choose a date range to run from. You can go away more specific. It works better when you target customers. When you do that, you are not talking about the price, but you are talking about a problem that someone has. For example, if you choose a women aged from 30 to 65 years old who owns pets, create an advert that’s relevant to this demographic. For more tips, don’t miss our next videos – click here to sign up to our newsletter.